Rhonna continues to share 31HalloweenIdeas over on her blog this month. You may have seen these CandyCones highlighted last week. This is a simple, simple idea that is always so happily received as a quick and easy gift no matter the season. 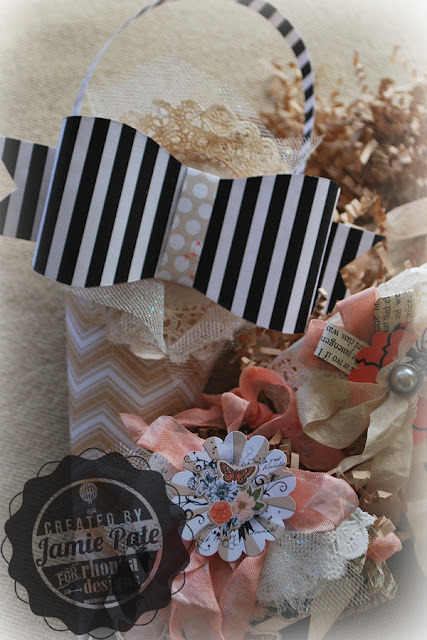 And while I used the printables from the SpookyJunqueCandyCones kit, and while there are some specific halloween themes found on those printables, the cones are so versatile for any occasion and season. 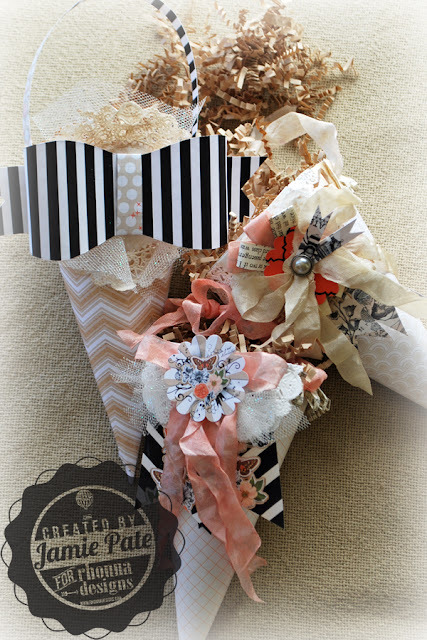 Dress them up with scallop punches and seam binding, and pearl brads and book paper strips and...oh my...however you would like. Lady Eve is part of my front room decor. She is an altered dress form. But I have been adding and changing her up a bit from season to season. I think everyone needs an altered dress form to play dress up with. 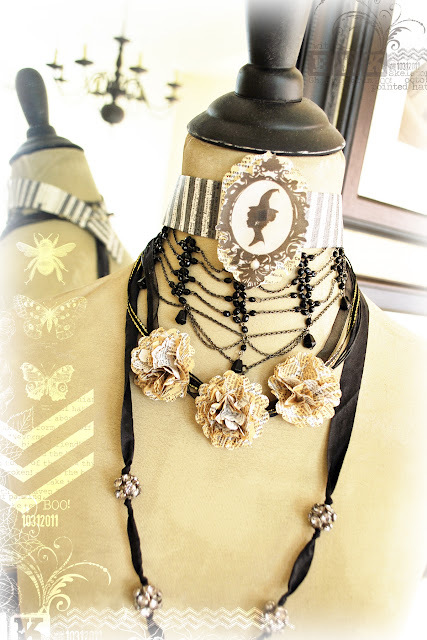 For her necklace I took the WireFence pattern from the SpookyPrintableBackground kit. I printed the pattern out on dictionary paper. Then I punched several scallop shapes and made layered and scrunched up flowers. 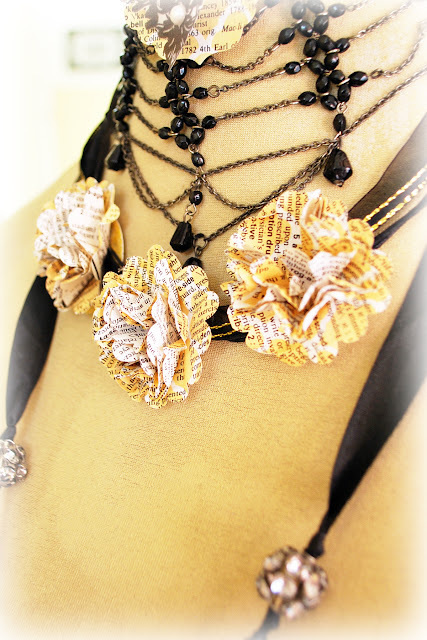 Having made three flowers they were then attached to black and gold sheer ribbon and added to Lady Eve's neck. 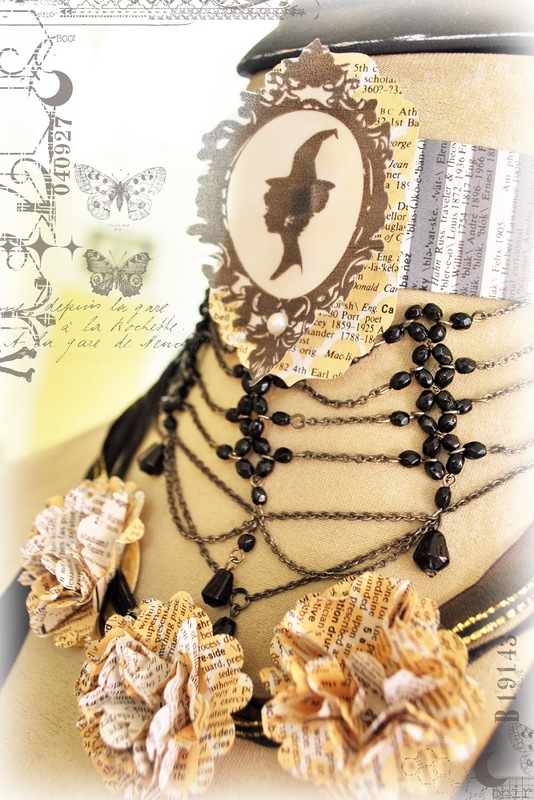 Her chocker was made by printing the BlackStripe pattern onto a dictionary page. That is the part actually wrapped around her neck, the actual chocker part. Then I die cut a large label shape from the WireFence that was left over printed on the dictionary paper. Then I printed a silhouette from the SpookySilhouettesBrush kit onto vellum. This was fancy cut out and then layered atop the WireFence pattern label shape and then adhered to the BlackStripe chocker part. and oh how I love this layered look. and how festive she looks for the month. and now off to think how to dress her for her next seasonal debut. now go...dress up your space with fun and spooky designs. Love this, Jamie! Absolutely gorgeous! OH MY GOODNESS Jamie this is just EQUISITE I LOVE IT TO PIECES!! kim...there is one there now.